RANDOM BENGAL THOUGHTS - THE BENGALS FORUM - For Bengals Fans *Only* - Go-Bengals.com - The Best Bengals Fan Community in the World! I actually like the look of that helmet better than the one we use...I wonder if there are any plans to ever use that design? those are awesome helmets i would love to see them in a game espically the black on black unis awesome pic bj nice work for the 4958409854098509485 time! Hey BJ, I want one of those neon Tiger's Head lights. Where'd you find that? E-Bay, perhaps? 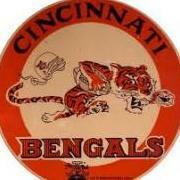 [quote name='calibengalfan' date='Mar 6 2005, 06:08 PM']Hey BJ, I want one of those neon Tiger's Head lights. Where'd you find that? E-Bay, perhaps?